In 1721 a man named Pierre Jaquet Droz was born in Chaux-de-Fonds in Switzerland. From an early age he had an interest in, and developed a skill for clock making and mechanics. From his abilities he was able to build complex animated dolls, clocks, and mechanical birds. 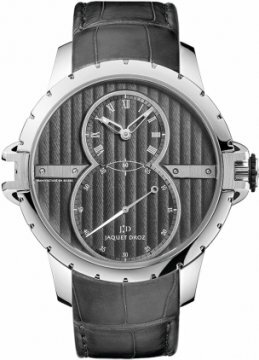 Jaquet Droz lived in Paris, London, and Geneva throughout his life from which he was able to build contacts and expand his business relationships. From 1738 to 1747 he was involved in clock making from which he was able to build a large clientele of wealthy clients. In 1758 Jaquet Droz brought his clocks to Spain and was able to sell them for large amounts of money enabling him to secure the necessary funding to allow him to concentrate on watch making. 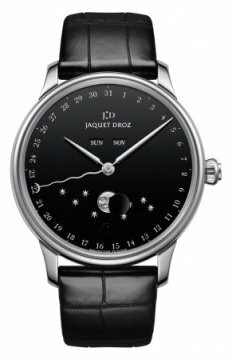 This could be seen as the birth of Jaquet Droz watch making, and the tradition of excellence in watch making continues to this day. 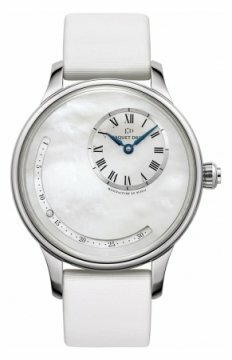 1774 was another important year for the Jaquet Droz brand; it opened a workshop in London and began to export to Asian countries including China, India, and Japan. Jaquet Droz started making watches with complications in 1784 after they set up in Geneva. The end of the 18th century was a very tough time for the brand, the loss of a number of contracts meant Jaquet Droz was in serious financial trouble. In 2000 the Jaquet Droz Company was bought by the Swatch Group which allowed it access to the massive network and resources of the Group and this led to a resurgence of innovation and creativity of the Jaquet Droz brand. Its revival was complete in 2010 when it returned to the place of its birth, Chaux-de-Fonds and opened a huge premises utilising the latest in modern technology and manufacturing processes. 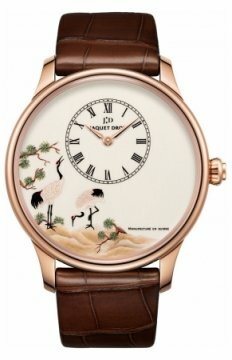 Jaquet Droz has developed a style all of their own with their unique dial structure on the watch face and intricate and decorative time pieces inspired by a range of areas including nature and culture.